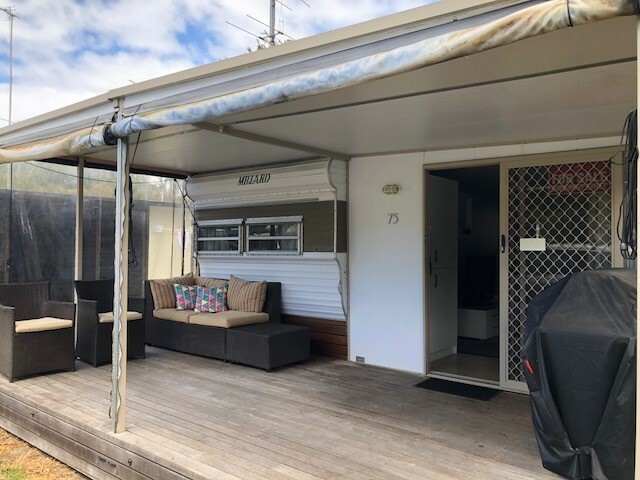 This beautifully presented caravan and annex is located in the heart of the Surfside Caravan Park and is a rare opportunity to get into the market. Looking out on to the play area from the large deck the caravan oozes class. You can watch your children play while entertaining on the deck. The caravan and annex can comfortably sleep 7-8 people while a well equipped ensuite ensures comfort. A new hot water service makes sure hot water is pumped quickly throughout the caravan. A double bed, bunks with trundle along with a new Ikea sofa bed makes sleeping very comfortable. Storage is cleverly located throughout the van and annex. A modern kitchen boasts, fridge, microwave, cooktop and oven. A beer fridge is hidden inside modern cupboards which provide ample storage. The large deck at the front of the van is surrounded by cafe blinds that can be lowered to keep the weather out in winter. A bbq, an outdoor table and chairs along with a tabletop heater is included and can be used on the decking area.